The Reformation started breaking apart shortly after Luther’s dramatic appearance before the Imperial Diet at Worms in January 1521. His duke, Frederick the Wise, had kidnapped Luther for his own safety and spirited Herr Doktor Martin away to Wartburg castle. While he was absent, Luther’s second, Andreas Bodenstein von Karlstadt, started pushing Luther’s sola scriptura down paths that Doktor Martin had never intended. Iconoclasm and popular enthusiasm, led by the Zwickau prophets, became the order of the day. Luther in Wartburg was sick to his stomach. Constipated and nauseated, Luther had assumed the name of Knight George. The knight’s diet was far different than that of the austere Augustinian friar, and it left him with gastric problems. These difficulties paled in comparison to the news from Wittenberg, and in spring 1522 Luther returned to Wittenberg, squeezing himself into his old friar’s habit to hold forth on the implications of his new doctrine and what restraint and moderation it enjoined (it didn’t include iconoclasm or scrapping the Mass), virulently denouncing Karlstadt’s violence. But Luther’s reformation soon faced greater contradictions than the raving enthusiasms of the soon-to-be marginal Karlstadt. Threads pulled by Luther’s erstwhile colleague, which threatened the complete unraveling of Luther’s tapestry, were now not only being pulled, but were being rewoven into what Luther thought a completely new cloth. Ulrich Zwingli, a German-Swiss priest in Zurich, had in that same Lent that Luther came denouncing Karlstadt for innovation, stood by and blessed some of the faithful of Zurich as they ate sausage on a Lenten Friday. While this would not seem the equal of smashing church windows and statuary, it was just as much a revolutionary act, for it equally cut at one of the most basic and ancient assertions of asceticism. What is more, Zwingli was the most visible minister in Zurich, being the pastor of the Great Minster, the city’s largest church, making him effectively the city’s preacher. Iconoclasm, the ending of monasticism and the complete revision of liturgical texts quickly followed. Zwingli, as had Karlstadt, approached the question both of religion and reform differently than did Luther. This comes out most forcefully in his Eucharistic thought. Zwingli was a humanist. Following trails he thought blazed by both Luther’s sola scriptura and Erasmus’s debt to a simplified piety as expressed in the Devotio moderna (cf. Thomas à Kempis’s The Imitation of Christ), Zwingli preached that the sum of Christian piety arose, resided in, and was given meaning by faith. For Zwingli, following Luther, the church was comprised of the elect, those to whom God had given faith. But while Luther saw God’s grace truly present in both baptism (God’s promise and God’s act of regeneration) and the Eucharist (Christ uniting himself to us more truly as one flesh than bride to groom in marriage), Zwingli at best saw baptism as a uniting of the recipient to an outward form, incorporation into earthly and material expressions of what had truth ultimately only in heaven. This is part of his covenant or federal theology, by which infants are brought into the visible church and exposed to the audible means of grace, the preached word (by which comes faith). Faith was very much the same thing for Zwingli it had been for Luther, the assent to and trust in the salvific message of the Gospel. But for Luther, the materiality of redemption could not be jettisoned simply because faith and trust were acts of the intellect and will. For Zwingli, however, they most necessarily had to be, since God chose not use material things to convey the immaterial item of faith to our heart. How this plays out in his Eucharistic thought can be seen in his 1525 treatise on the Lord’s supper, in which he identifies eating the body of Christ as nothing other than believing in the crucified Christ. Zwingli takes the whole of John 6 as nothing other than a long exercise in Christ confusing the Capernaites by making them think he was preaching transubstantiation or consubstantiation (which Zwingli sees as far less acceptable than transubstantiation, though he thinks the latter an enormity as well), and then only cluing the disciples in on the secret after everyone walks away having misunderstood our Lord’s words. According to Zwingli, in John 6:63 Christ explains that it is the Spirit that quickens, the flesh profits nothing, so therefore Christ’s flesh has nothing directly to do with obtaining salvation, except insofar as it is the object of faith. Thus eating Christ’s flesh and drinking his blood just means believing in Christ, for any participation in flesh is a deprecation of the work of the Spirit. Zwingli’s treatise was part of the first Eucharistic controversy (the second breaks out in the 1550s and goes into the 1560s), which came to its conclusion in the 1529 Marburg Colloquy. The Lutheran prince Philip of Hesse sought to form a military league for the defense of the new religion. Luther was wary of such an endeavor, but agreed to a colloquy, that is, an extended disputation (it lasted three days) with the Swiss on this matter. Anyone of note among the early Protestants was there (Karlstadt, who had written a number of treatises on the Eucharist sought to come, but was flatly denied). The whole affair was done in German for the sake of the audience (largely nobility and people of prominence), and while agreement was noted on the primacy of scripture and justification by faith alone, the question of the Eucharist turned the whole proceedings to the bitter and acrimonious (Zwingli was embittered!). 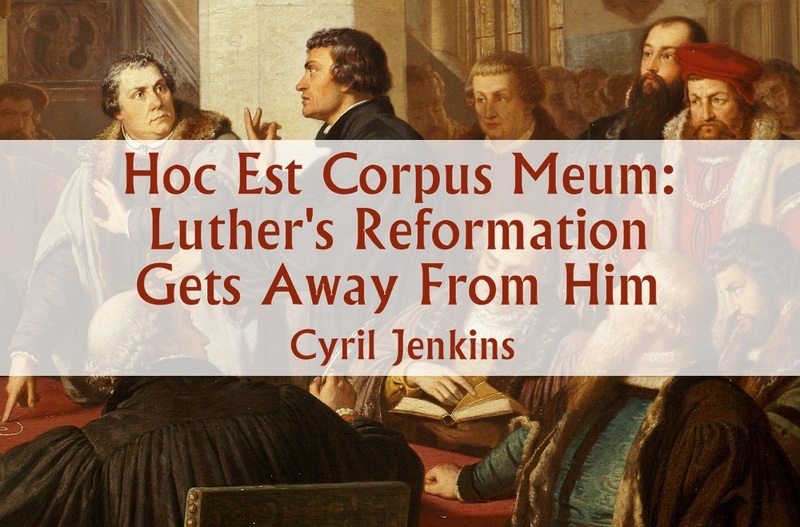 Luther held fast to the normative and interpretive power of the words of institution, hoc est corpus meum, writing them on the table and repeatedly coming back to them against Zwingli and his colleague, the Basle reformer Oecolampadius. For Luther, these informed us how to translate and interpret the rest of Scripture. Luther refused even to shake hands with the Swiss, except with the proviso that it was merely with other men made in the image of God, but not with them as Christians, for they were “of another spirit.” For Luther, there was no communion with the Swiss. The church historian Philip Schaff in his eight-volume history of the church (it ends with Calvin) largely reproduced whole affair and can be read online here (introduction and prehistory of the Colloquy) and here (the debate itself). At those sites you can behold Luther in all his polemical (and scatological) glory. The publication of the Zürich Consensus brought a response from the Lutheran minister of Hamburg, Joachim Westphal, who called the Eucharistic doctrines of the Reformed a Farrago (“a confused mixture”; this was the title of his first book on the matter), and that the Zürich Consensus did nothing but paper over the real differences among the Reformed on the question. He cited at length several of the Reformed, including Calvin, showing how out of step the Genevan was with his coreligionists. Calvin responded, and Westphal did the same: wash, rinse, repeat (for an expanded account see this author’s forthcoming Calvin’s Tormentors). Among those Westphal cited as holding an opinion at variance with other Reformed was Peter Martyr Vermigli, the former Augustinian canon from Florence who was then teaching at Oxford. Vermigli had left Florence and came first to Zürich, and then to Strasbourg, but with the defeat of the Lutheran Schmalkaldic league in 1547 he took to England, then under the Protestant regime of Edward VI. Upon Edward’s death Vermigli returned to Strasbourg, but the Peace of Augsburg in 1555, which recognized only the Lutheran and the Catholics, would drive Vermigli from Strasbourg, and land him again in Zürich, where he remained till his death. Before being driven from Strasbourg for his anti-Lutheran views, Vermigli had written a letter to the English Church in Frankfurt, telling them that they were better to leave their children unbaptized in hopes for the appearance of a future Reformed minister, or upon making other arrangements, than to have them baptized by the Lutherans. Why? Because while the Lutherans are correct about justification by faith alone, their doctrines on the Eucharist and Christology (these two were of a piece in the sixteenth century) had left the Lutherans with another faith: they really weren’t Christians, and there could be no communion with them. The reason for this is what Vermigli called Ubiquitarianism, which means “everywhereism,” a doctrine he said the Lutherans held to justify their doctrine that Christ is physically present in the sacrament of the altar. It should be noted that none of the Lutherans confessed this, but rather that wherever the divinity of Christ is, thus there could be his physical body, since the two cannot be divided or separated, though certainly distinguished. For Vermigli this made Christ but one nature, his divine one, for it had destroyed his human nature, whose property it was to be localized in one place, and thus the Lutherans were guilty of Monophysitism. This same stringency can be seen in an aside that Vermigli makes in another letter, one to the “stranger church” in London (these were churches for foreigners who found themselves in London, were under the bishop of London, but not under the rites enjoined within the English church). Reflecting on the peculiarities of certain Anabaptists who believed that Christ had celestial flesh, taken not from the Virgin but from heaven, he said they worshiped an idol of their own imagination, and not Christ. He then notes “We should not enkindle hostility toward Luther. We have decided nothing about him, since at his end or when he was giving up his soul God could have enlightened him, as I convince myself Cyprian did when he shed his blood for Christ.” Thus for Vermigli, the best he could say about Luther (which he did not say about other Lutherans, whom he held to be heretics) was that he believed the great man came to his senses as he lay dying. The Reformation was not some monochrome affair with the great champions Luther and Calvin fighting against the hydra antichrist of Rome, but was a play that saw the Lutherans stridently pitted against the Reformed, the Reformed vituperatively armed against the Lutheran. And while the two sides never came to blows, they weren’t above using the power of the princes against each other. Any thought that they shared the same faith is just modern romanticism that doesn’t see as important what the Reformers themselves did. 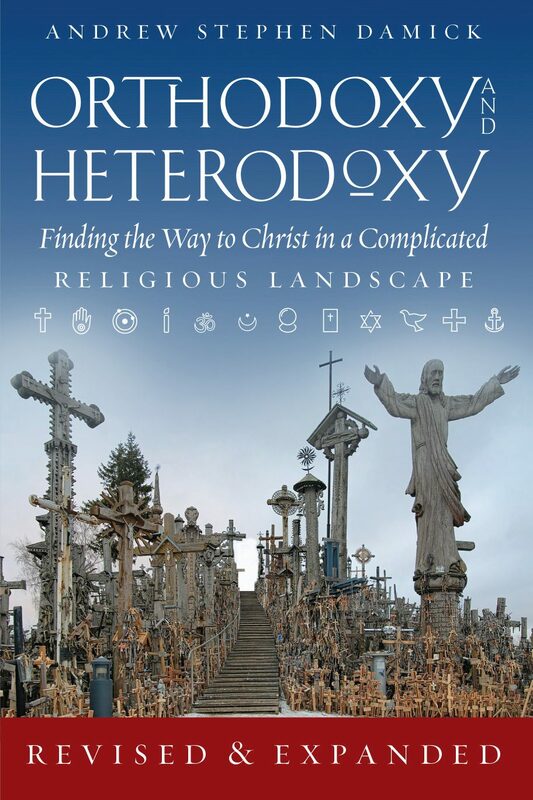 Dr. Cyril (Gary) Jenkins is the Director of the Center for Orthodox Thought and Culture, and the John H. Van Gorden Professor in History and History Department Chair at Eastern University in St. Davids, Pennsylvania, and a member of St. Paul Orthodox Church in Emmaus, Pennsylvania. He also blogs at Lux Christi. This is an excellent post and very informative. I know many Protestants today who would do well to read this and consider what they are taught by their various denominations and consider all the intrinsic contradictions that founded Protestantism. What strikes me most of all is the hatred, division and judgmentalism that abounds then and now. Vermigli’s words regarding others as non Christians would sound familiar to many I know as they hold the same attitudes. It is a sad consequence of the Reformation and the seeds of its destruction.